Love, Mrs. Mommy: The Cubbie Lee Toy Company Has Quality and Educational Toys at Wallet-Friendly Prices! 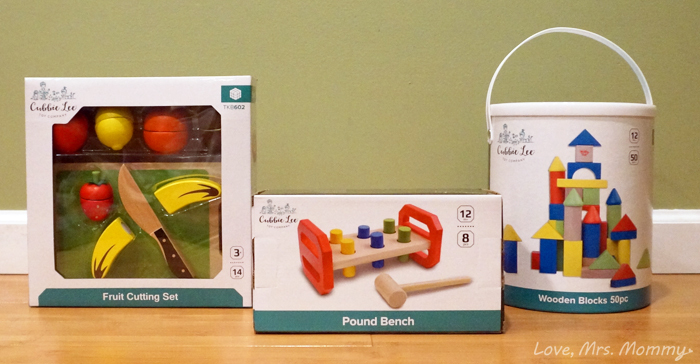 The Cubbie Lee Toy Company Has Quality and Educational Toys at Wallet-Friendly Prices! I received these toys at no cost to facilitate this review. All opinions are my own. This post contains affiliate links. My daughter is quite the toy-lover and I bet it’s safe to say, all the little ones you know and love are the same! However, all toys are not made to last and many break or wear down after just a little bit of use. If you’re like me and tired of spending money on toys that only last for a hot minute, you are going to be as excited as I was to find out about the Cubbie Lee Toy Company! The Cubbie Lee Toy Company was founded by parents, Zach and Sarah. After having their first child, they wanted toys that were built to last, as well as educational, affordable, and of course… fun! With this in mind, they developed their company and lovingly named it after their family dog. (How cute!) Now, all across the US, kids are able to play with their quality, wooden toys that are backed with a 5 year warranty! Plus, they are tested to the very highest of safety testing standards! Love it! With all the amazing toys they have to offer for ages 6 months to 5 years, I had a hard time deciding on which items to review. After much debate, I decided on the Fruit Chopping Set, 50 Piece Block Set, and the Pound Bench. I couldn’t wait to see what my little sweetheart thought of her new toys! 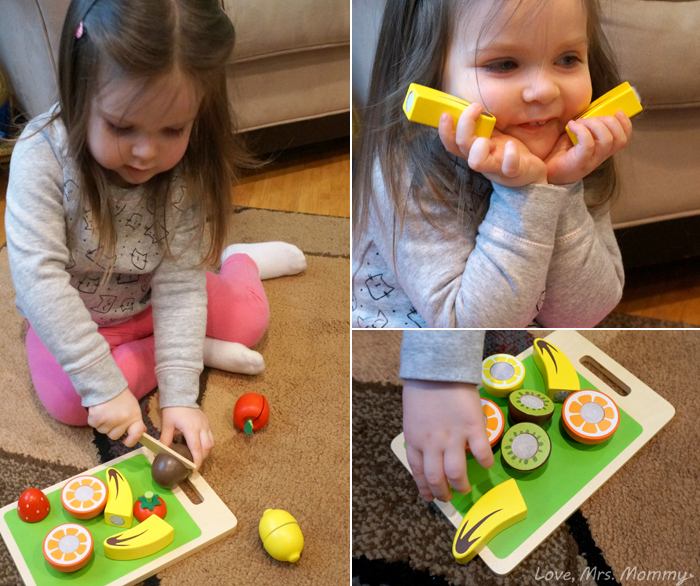 The Fruit Chopping Set is beyond adorable! This was the first item I picked out for my daughter, as I knew she was going to love cutting the fruit, and I couldn’t have been more right! Score for mommy! She immediately knew what to do when I opened it up for her and she had a blast cutting the fruit in half. This set comes with a cutting board, knife as well the following fruit; kiwi, banana, apple, orange, strawberry, and lemon. A really cute feature of this set is the inside design of each fruit. They made it really look like you have cut through the fruit, showing off the orange slices, apple core, etc., which is just adorable! The halves are held together with a Velcro center, making for easy attachment and detachment, allowing your child to play without assistance. My daughter adores this set and has such a great time playing with it! Great for hand-eye coordination and imaginative play for those aged 3+. Available for only 15.99! 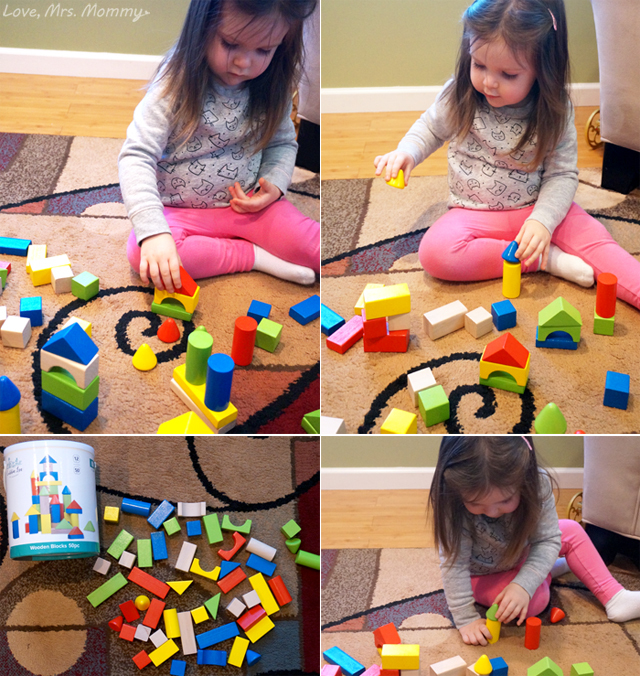 The 50 Piece Block Set is a classically fun wooden toy that will span generations. Great for motor skills, hand-eye coordination, as well as being a great tool to teach shapes and colors. With all the different combinations your little one can make with this set, they will have hours of fun. My daughter is particularly interested in making houses for her dolls and a castle for her princesses! Of course, what’s just as much fun is knocking everything over to start work on your next masterpiece! Great for 12 m+ and once they master the 50 piece set… you can graduate to Cubbie Lee’s 100 piece set for double the building fun!! 50 piece fun for only $20.99! 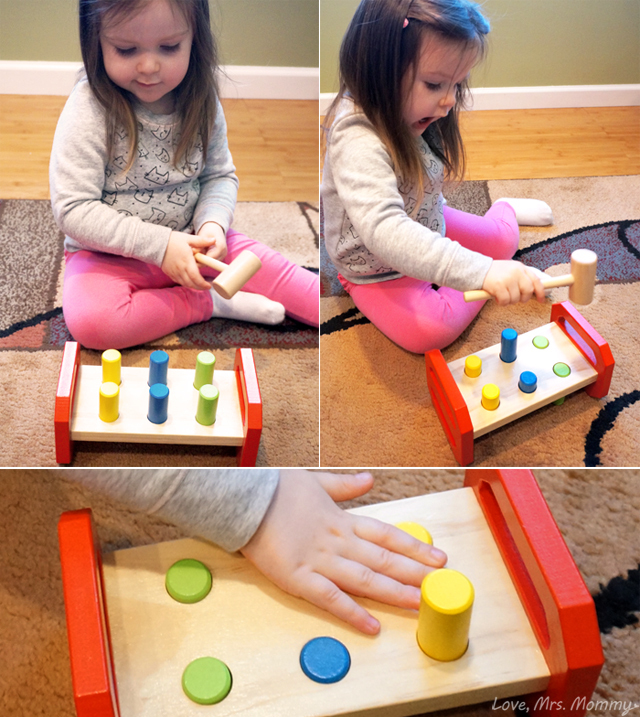 The Pound Bench is such a cute and entertaining toy for little ones. I gotta say… I wasn’t sure when I picked this out, if the pounding was going to bother me, but it absolutely doesn’t! It’s not an obnoxious noise or even really loud. It’s more of a tap sound than a loud bang, if you will. Wondering if even this toy is covered by their 5 year warranty? Why, yes it is! My daughter has a great time pounding away on this toy and enjoys flipping it over to start the fun all over again. She even found out that you can pull the pieces out and re-arrange the colors. She has been re-ordering and pounding them in their newly arranged positions till her hearts’ content. Also, she even found it fun to push them down with her hand. Perfect toy for hand-eye coordination and for helping to expend some energy. If only I could bottle some of that up and use it when I needed it, haha. This toy is also wonderful for ages 12 m+ and is available for only $15.99! My daughter loves her new Cubbie Lee toys and has been playing with them non-stop! With their wonderful standard of quality, while offering reasonable prices, you don’t have to break the bank for your child(ren) to have fun and learn. Plus, these aren’t toys that are going to break after playing with them for one day, even with the toughest of toddler play! They could definitely stand up to getting passed down to another child, who is eager to have some fun. With Cubbie Lee, get ready to save some green and have a whole lotta fun! Connect: Find out more about the Cubbie Lee Toy Company by visiting their website. Then make sure you “like” them on Facebook and follow them on Instagram. Buy It: You can purchase any of the toys found in this review and so much more on their website or on Amazon! Giveaway: Cubbie Lee is giving you a chance to win $195 worth of toys every week! Enter for your chance to win here! They have some very cute toys. My granddaughters love to pretend. They would love the one with the fruit. Wow! I'm really loving these toys! My toddler has always been a lover for any toys that are wooden! I have a wooden block set from when my 32 yr old son was a toddler & so many of my other children & then my grandchildren have played with those same wooden blocks! My sons little girl is 2 yrs old & plays with them & he thinks it's pretty amazing! I really like the wooden food-cutting set. I would cut my son's food and have him practice with the wooden set! Very good for fine-motor development. Looks and sound as though these toys are very sturdy to last a long time. Oooh I love the quality and great colors!! My son has velcro fruit and he seriously spend hours cutting and cutting!! I love these toys! Great review. Thank you for sharing. so many great hands on toys. I love learning through play and with these toys they will do just that. What great toys--I've never heard of this company, but I have an 8 mo. old grandson, so I need to check them out! I love the food pieces! I've always wanted to get my daughter a set! I am so loving these toys, I love wooden toys, and I love that fruit , like having a snack in the afternoon. These are so cute. My niece would love this. These are quality toys that are colorful and durable and can be bought at a great price.